I haven't been writing much lately and the series of posts (from the last year road trip) which I had to complete a long back are still pending. Though it's difficult to recollect everything, I'm trying to post at-least what I have remember from the trip. In the last post, I shared my experiences of my visit to Mandu. 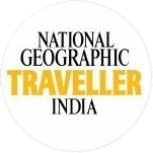 The trip was planned well in advance and we were going as per the plan, so the next place in our itinerary was one of the oldest cities of Madhya Pradesh i.e. 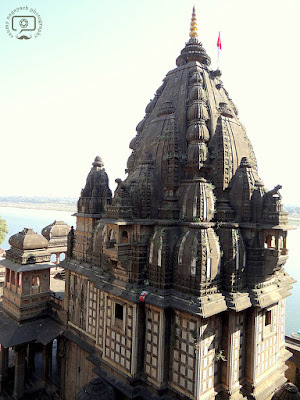 Maheshwar. 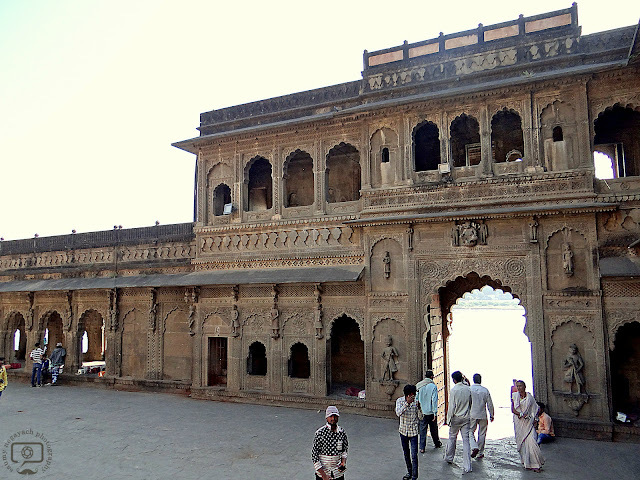 Maheshwar is located at a distance of 40-45 km approx from Mandu. It used to be known as Mahishmati and mentioned in the epics of Ramayana and Mahabharata under its old name. Does the name ring a bell? Mahishmati from the epic 'Bahubali' series. Well, if you have started relating things then please don't go further and pull back your thoughts. It ain't the same Mahishmati but the city has great significance in the Indian history. 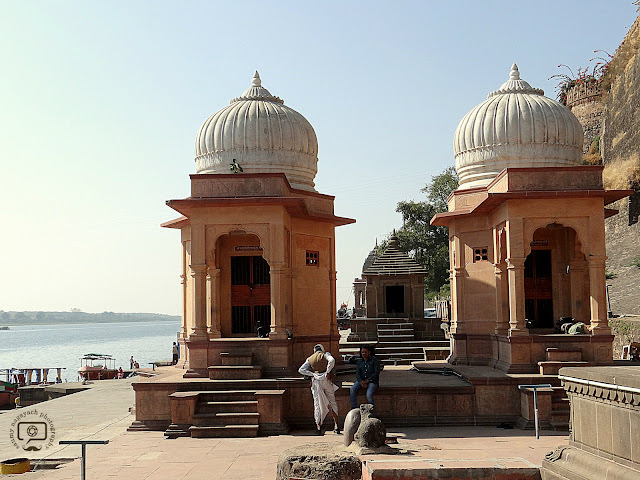 Maheshwar is situated on the banks of the holy river Narmada. 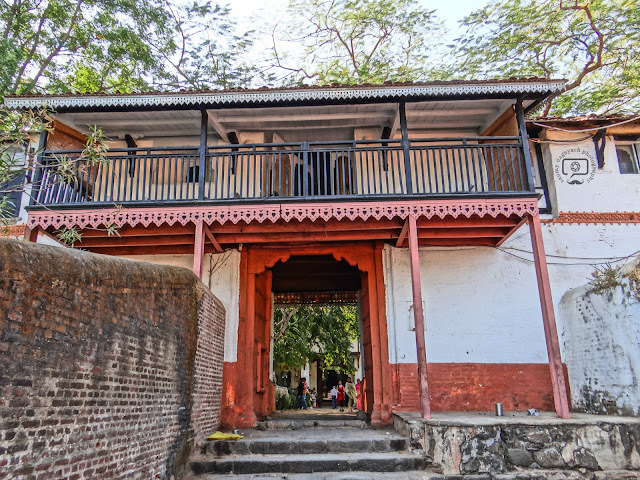 It's a small town but is known for many great things.In the 18th century, Holkar Queen Rani Ahilyabai of Indore revived the soul of the city and shifted the Holkar capital from Indore to Maheshwar. Under her reign, the city witnessed a great transformation; a lot of buildings were built and public works were completed. 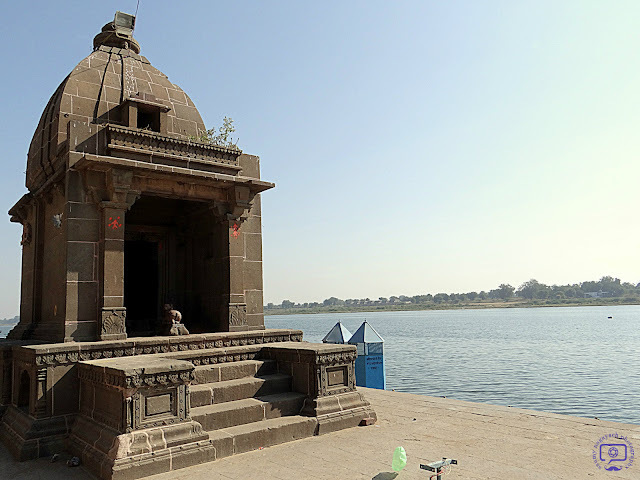 Since Ahilyabai was a great devotee of Lord Shiva, she built many temples and ghats across the country, including the Lord Shiva Temple on the ghats of Narmada. 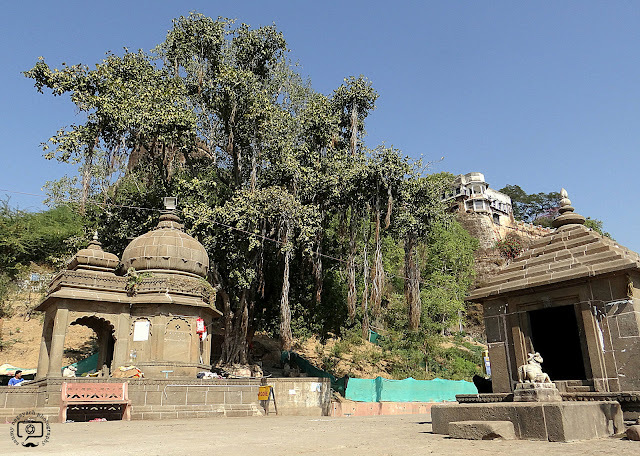 The temple has astounding architecture and since it's built adjacent to the Ahilya Fort, the view one gets from the top of the fort is surreal. And the feeling of 'Bhagwan sabke dil ki baat sunte hai' was proved 100% true!! After the meal, we walked down to the Ahilyeshwar Temple and spent some time at the Ghat. Since it was quite hot we couldn't manage to take the boat ride. 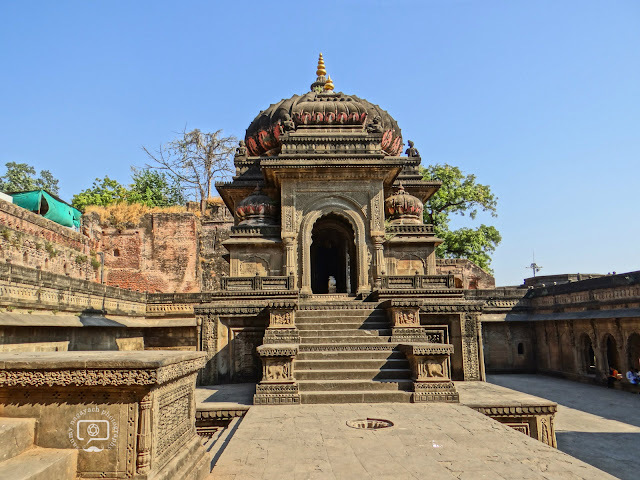 Apart from the majestic Ahilyeshwar Temple, there is a Chhatri (Cenotaph) of Vithoji adjacent to the temple in the precincts of the Maheshwar Fort. The artwork on the Chhatri (Cenotaph), Temple, Jharokhe, Windows, Overhanging balconies and Doorways tells a great story about the place and the artisans employed for carving spectacular designs on the Windows and Doorways of Fort. Devi Ahilyabai had a great vision and all the works completed in her reign proves that. After visiting the temple, we went on to visit the Rajgaddi and Rajwada (of Devi Ahilyabai) built within the Fort complex. 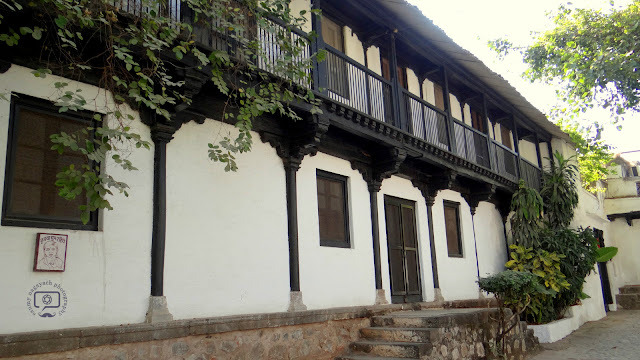 Within the complex, there are other collectibles of the Holkar Dynasty that are kept in other rooms for public display. 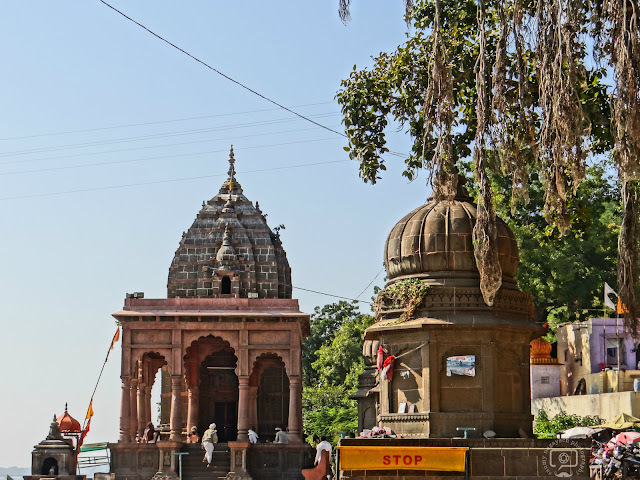 As we had to leave for Omkareshwar the same day, we started from Maheshwar at 2 pm. 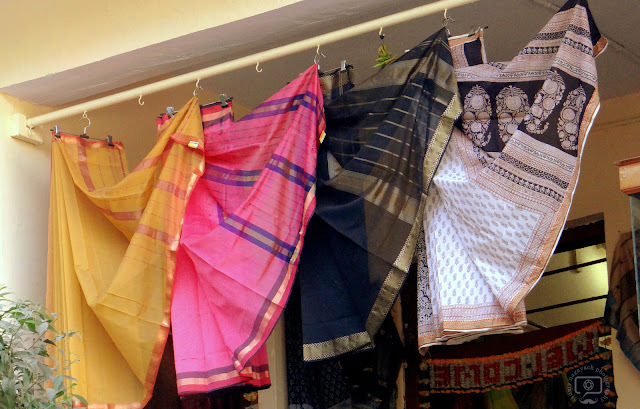 Maheshwar is also very famous for Maheshwari Silk and Cotton Sarees, so before leaving my mother did some shopping and then we left for the holy city of Omkareshwar. Also, it would be wrong if I do not mention that Maheshwar is one of the few cities of Madhya Pradesh that has attracted the Film Industry many-a-times. 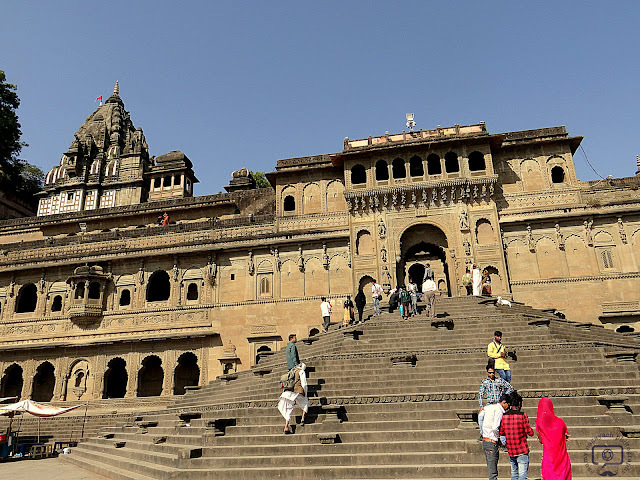 There are many movies and TV shows that have been shot in Maheshwar. Ashoka, Yamla Pagla Deewana, Tevar, Bajirao Mastani and Jhansi Ki Rani to name a few. Note: Few details have been taken as a reference from Incredible Madhya Pradesh. I am taking my Alexa Rank to the next level with Blogchatter #MyFriendAlexa. My current Alexa rank is 24,75,895. 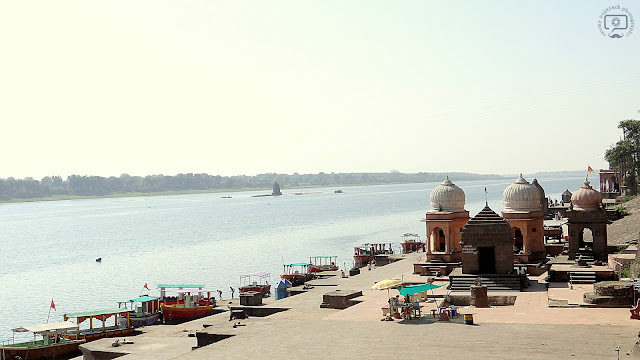 This is gorgeous Saumya.I would love to visit Maheshwar.The temples and carvings look stnning .I have heard a lot about the river Narmada and its temples. Saumy, your photos are amazing. It feels like I have visited the places you had mentioned. And Maheshmati word created a lot interest. heehee. Very detailed and informative post. Lovely photographs Saumy! The carvings look beautiful. I hadn't heard of this place before, but now it's definitely going on my list of places to visit! The pictures have that old rusty feeling to this place. Saumy, the photos on your travel posts are quite breathtaking. Makes one yearn to visit. Great job! I'm getting used to your gorgeous pictures. Those banyan trees look eons old. The river side looks inviting. I really need to do an MP trip. 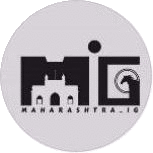 Maheshwar is so close to Indore and yet I have never visited this wonderful place....however, I always recommend it to guests. Your post just made my resolve stronger. And the pics here are absolutely superb. 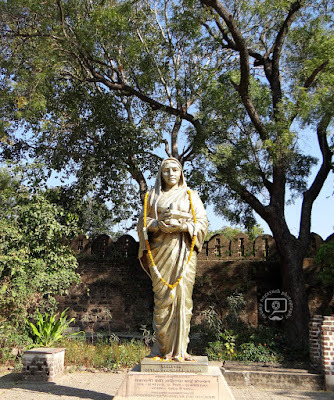 A city famous for its temple, bathing ghats, mighty fort complex which stand in quiet beauty and splendor mirrored in the river Narmada and obviously its exquisitely woven ‘Maheshwari sarees, revived to its ancient position of importance by the Holkar queen Rani Ahilyabai of Indore, who transformed this land into a land of tranquility and prosperity. These sariees are famous throughout India for their excellent floral designs. When I read Mahishmati , I was hooked . Loved your pictures and detailed post. I haven't been anywhere in Madhya Pradesh and my resolve is strong now. What do you get to eat there? 😁 And movies shot there was a cool addition. The moment I saw Maheshmati I was transported into the movie frame. Keep the travelogue going... Jai Maheshmati!!! Amazing pictures and very descriptive write up. Actually you have took me to a virtual tour by your post. 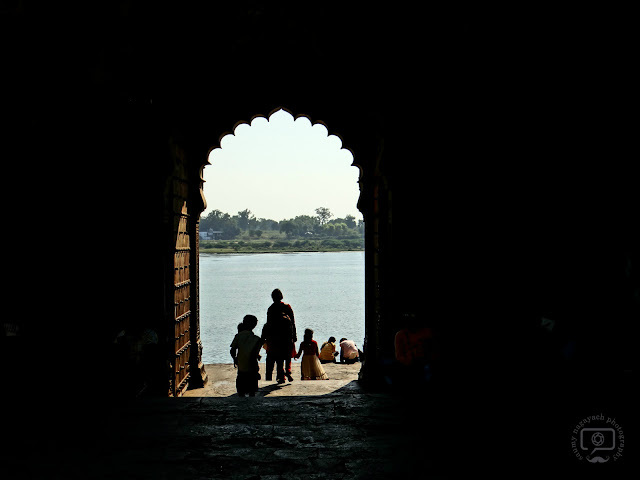 I have added Maheshwar to my bucket list. Happy to join with you for #MyFriendAlexa. Wow! That is stunning architecture and beautiful pictures! I am adding Mandu to my wishlist. Well you definitely covered so many places in one day. The architecture of the temples is indeed intriguing. Also do let me know from where did you shop the sarees, I will make a note of it for my visit. Compared to the many forts I have seen In Maharashtra, Ahilya fort looks quite well-preserved. The temples are beautiful. Loved your pictures and the information you shared with it. I admire your photography. I think I've told that before too. I'm not much of a travel bug, but your posts do manage to help me travel there virtually. Thank you, Saumy. The photography is beautiful Saumy, looks like the living images of Mandu and so many beautiful artistically wonderful places. Thank You for taking us on the journey with you. I've always heard that Madhya Pradesh is a beautiful place with rich cultural monuments. 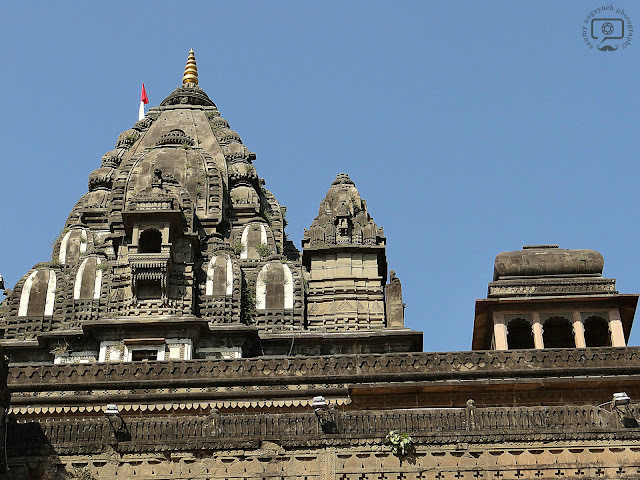 It's nice to get to know about Maheshwar, it has a simple grandiosity about it. Thank you for taking a ride into the beautiful Madhya Pradesh. Maheswari saree's in divine city makes us feel sacred. Special credits to your snapshots. Lovely post. The pictures are icing on the cake. Lovely photographs. Liked the way you have narrated the story. Thoroughly enjoyed reading your post. I have heard and read about these places in books or in serials. It will be a good experience to go and visit them. Very well written travelogue with all the details. Thanks for the detailed post. Felt like I was right there ..
Maheshwar is quite similar to Pushkar. The architecture and the way ghats look...it is quite similar. Probably, it has to do with both being sacred in Hindu religion. In fact, the house also looks similar to the ones in Rajasthan. Enjoyed this post. First of all beautiful captures Saumy :) And the composition of backgrounds you managed to attain in some clicks is impeccable. Well you already know I love to explore places with historical significance and this pictures made me envy you that u made it there :P. As-usual the post was filled with the details one would want to know before visiting this place. My first reacn to the name Maheshmati was just that ;-) This place is gorgeous and I am surprised that its not on my list of travels yet. Beautifully captured and present Saumy! Love, love this post. I too am in love with the ghats of Maheshwar and the river Narmada. Fantastic pics too. I relived my time there. the pics are just too good. This is one of the best posts on travel I have read. Wow I didn't know about this place. Such beautiful ancient architecture and from your photos it appears that it is well maintained too, something we don't often see at our heritage sites. 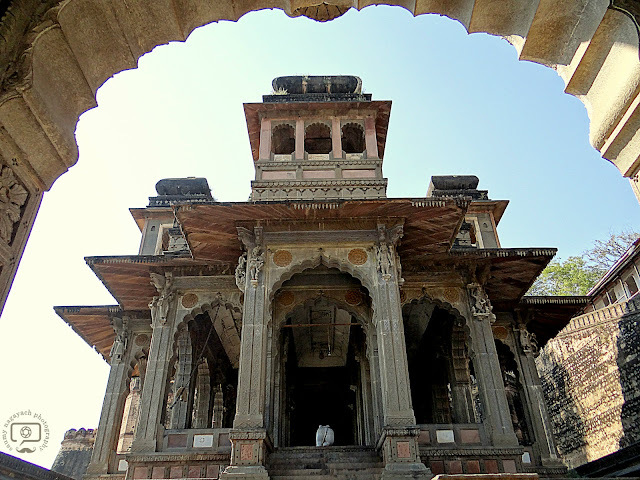 You have depicted the history of Maheshwar very well through photographs. You have captured each and every point so well. To tell you I never knew about this city. Great travelogue. Beautiful architecture. How blessed you are to have had the opportunity to see this historic city. Wow! The pictures of the temples look so beautiful. Enjoyed reading this travelogue. This seems to be a beautiful and serene place. Enjoyed reading about it. Thank you for this virtual tour. This place is amazing. Loved the pictures. You managed to capture the essence of the place beautifully with these amazing photos even when it was sweltering. That's commendable! Stunning Pics. It's so beautiful. Love to visit one day. 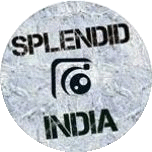 Wow loved your post and specially the pics. I love travelling and try to take a trip whenever I can. Loved the way you have incorporated all required details along with your thoughts and pics. The pictures are so good... Make me wanna go. Travel is life ! 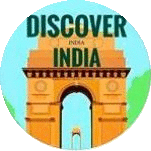 Amazing and superb pics of travel destination to explore. I personally loved Maheshwar. It seemed like a quieter version of Varanasi with so much history and colour. You have captured the historical society so well! Lovely clicks! Another great post and stunning pics! I have traveled more of Chattisgarh than MP. I plan to cover MP some time soon too. Will make use of your posts for better planning. Feels so good to read your posts and enjoy the virtual tour after a really long time. Hearing about the city for the first time and from the pictures and description, it's clear that it has got a lot of depth and character. 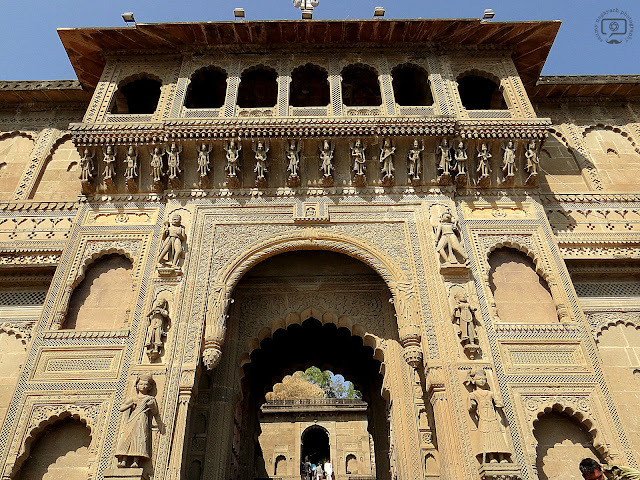 Fabulous captures as always, Saumy - the intricate architecture and the rich cultural heritage left behind by Rani Ahilyabai is indeed a treasure to cherish. Thanks for sharing the story and onward ho to Omkareshwar! What a hidden gem this is Saumy! I had heard about it but never knew it had so many fascinating monuments! The carvings on the gateway look so exquisite! Great captures of the temples and the ghats:) totally in awe of the place through your eyes:) Thanks so much for sharing this! Putting this offbeat place on my list! I really appreciate this wonderful post that you have provided for us. A blog is brilliantly written and provides all the necessary information. I assure this would be beneficial for most of the people.